To be honest I have not tried that many rainbow cakes in Jakarta (and I'm not keen to be an experiment bunny, stuffing all those food colouring down my own guts). Out of those that I've tried so far, such as that from The Goods Dept, Dapur Cokelat and Lily Cakes (at the Food Hall), my personal (and my brother's and sister's too) favourite is the one baked by Lolo, under the brand Le Sweets. WHY? 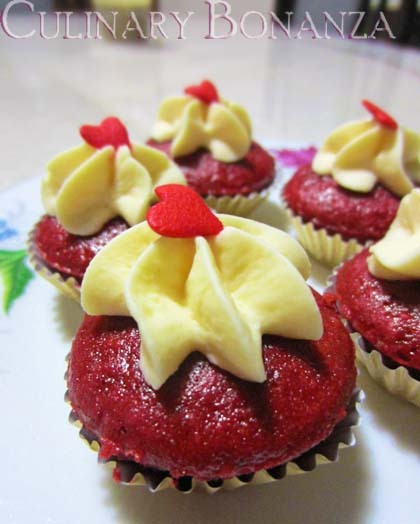 Le Sweets is a brand of home-made cakes, cookies, sweets and desserts that a lovely senior blogger of mine manages. I first heard of it a few months ago, when I saw someone displayed a photo of oddly coloured rainbow cake that resembled nothing like the rainbow colour spectrum. 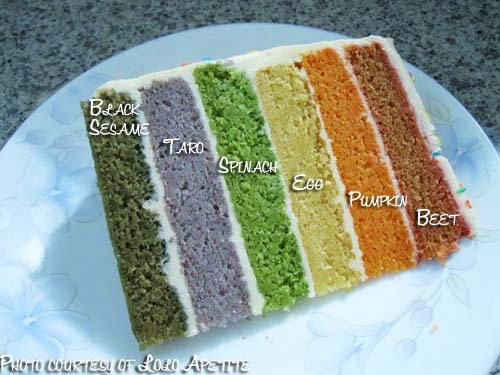 As it turned out, it was Natural Rainbow Cake, a product by Le Sweets and by far, is my favourite. 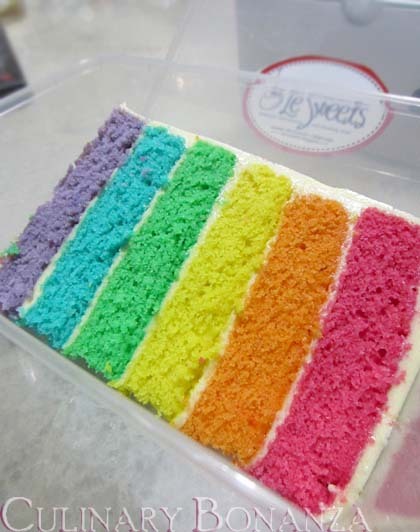 In my opinion, Le Sweets' rainbow cake is the most reasonably priced among others that are of comparable quality and taste (but I have not tried the others yet). Bluegrass sells for IR 60,000 /portion, Union Brasserie IDR 50,000, The Goods Cafe IDR 50,000. Le Sweets? Just for IDR 35,000 (not inclusive delivery charge yet). It's recommended that you order in bulk with your friends, so the delivery cost could be shared. 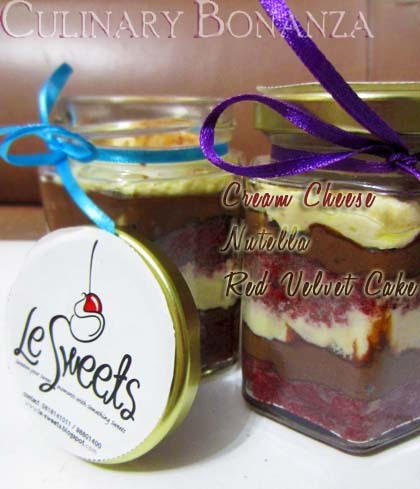 Besides the phenomenal rainbow cake, Le Sweets provides many other curious cakes and desserts as well, such as cookies, cupcakes, Japanese cream cheese tarts, cake-in-a-jars, macarons, puddings, etc. Just take a look at the Facebook page or the blog and prepare to drool yourself silly at those pretty-looking stuff! Among the more popular items recently is the thousand layers crepe (mille crepe). Just when you think the rainbow fever stops here, wait until you see the rainbow version of mille crepe by Le Sweets haha! Yea, long live rainbow cake!!! It is advisable that you order at least a few days or a week in advance, to make sure you get your orders on the day that you request. *) No Service Charge or Tax. Delivery charge varies depending on the location from Sunter.